Bob had finally retired and was looking forward to spending more time with Phyllis, his wife of thirty years. This extra time with Phyllis made him aware of things that he had, regrettably, missed during all those years when he was paying more attention to the wants and needs of others; and some things concerned him. He went to visit his long standing friend, fishing buddy and family physician, Ed. “Great, I’ll do it tonight…and we need to go after those strippers next month,” and with that Ed, assured he had his answer and could confront Phyllis with empirical evidence of her shortcoming. There are so very many sides to this man, not all pleasant to look at. He was undeniably…human and in many ways amazing. I have five siblings, a fact he often bragged about; my three sisters and two younger brothers (one I met when he acted as ring bearer at Dad’s wedding…to his mother). 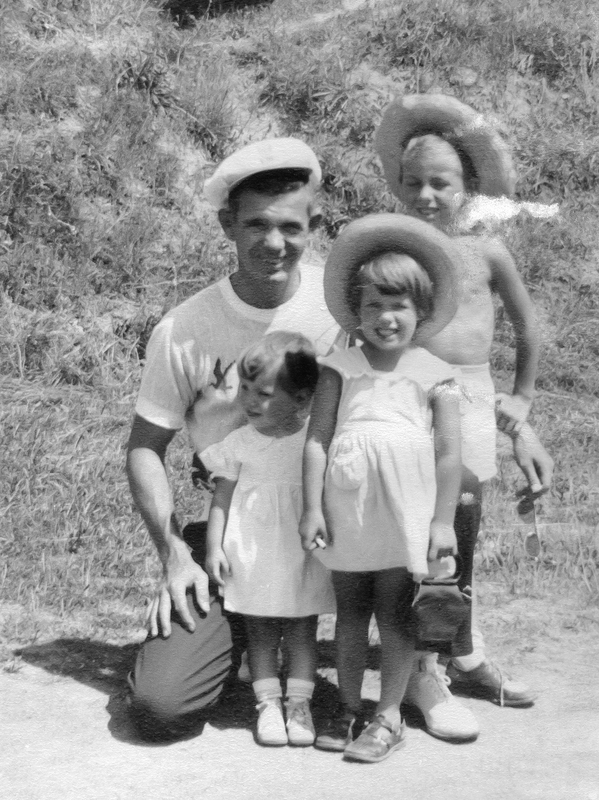 Dad had a habit of being out of the country when any of his children were born. I started the tradition. My mother and I lived with Mom and Grampy Vogt, in Scarsdale, which was to say, we were isolated from my of the world. Dad was being transferred to Norfolk, VA after serving three years as part of the Occupation Forces in Japan, the most important thing was I was going to ride a train with my Dad. Like most four year olds, I stood for the first few hours and demonstrating my rather precocious nature, I asked questions about everything. Dad demonstrated his wisdom…he answered each and every one. I continued to pester him for another four hours. Some how I knew that he had and would have marvelous gifts to share. “My eyes were closed tight, hands behind my back and by my reckoning; I jumped, maybe 6 inches high, over a twig. That was about a minute ago. I was waiting to land. I slowly peeked at where I was going to end up; and through my now opened eyes, I looked at all the stars…where a hall was supposed to be. “STARS, they were all around me; in front of, in back of me…” the Major turned to his left, tilted his head up, then down, spun left, then right,”…they were on top of, all around me, they were even under me, stars and nothing else. What happened to the hall, the hall that was on the other side of the twig? “What happened to my clothes, in the light of a gazillion stars I could see that I was no longer wearing my 49s sweat shirt and jeans anymore. The pants I was wearing were of a of a woolen type, a deep brown like the wet bark of a tree, a ruffled front shirt with lace sleeves the color of morning fog, braces of the deepest purple, a coat the color of a deep water lake collar rising up to my ears sleeves rolled back and draping to mid-thigh. I felt a little chill around my ankles and saw…the sneakers, an olive green with orange laces and no socks. “It was then that I noticed the hat. A scarlet hat of felt, yards and yards of felt. Something was tickling my right ear, like a bug buzzing to close; I went to brush it away and discovered it was a feather. The hat seemed to be growing feathers, long feathers, short feathers, straight feathers, bent feathers, when would it stop? I reached to the top of the hat; it stopped. The Major grabbed the brim of the hat and with a look of panic on his face. “From out of nowhere, there were clouds and water and very solid ground below me (I was sure it was below me this time) and I was going to die. “The wind was tearing at me as I fell faster and faster, it pulled most of the feathers from my oversized hat. I twisted the hat on tighter…and I slowed down, I tilted the hat right, and I turned right, with the hat over my right ear, the few remaining feathers flopping in the breeze, I was floating (again). Floating over a land that was nestled in the warmest corner of the calmest sea (and I had seen them all during my rapid decent). The Major extended his arm, with his hand open he gestured in a wave like fashion from corner to corner of the field he was in. “laid upon the ground for a giant’s picnic. “The splendor that was flowery field was dwarfed by the forest bordering it. Populated by trees of stupendous proportions, with bases bigger than houses, trunks and branches rising so high above they separated the clouds like foam on the shore wraps around a stone. The Major tilted his head up as he spoke, shifting his gaze as if talking to a much taller person. ‘Come, into the Wood.’ The Major said in a voice deep and pleasant. “As small as Charly was he moved very very quickly and it was a struggle to keep up and as I started to break into a run, he stopped, turned and faced me, fists on hips he looked at me. I was going to run him over or if by some miracle I could stop my feet from moving I was going to fall face first into the mossy ground or on top of Charly. My olive green sneakers (with the orange laces) held their ground as if glued to the forest floor, my woolen trousers grew ridged and it was the very purple braces that kept me from flying out of those same trousers as I waved back and forth like slinky on an incline. “’Are you always this slow? Why ever do they call you, ‘Quickstep?’ Charly stood in a one of the scattered shafts of light that made their way thru the dense canopy above. Charly gestured toward the ground around him, as if on cue a breeze shifted the trees and the pin points of light danced through the forest. ‘What do you see?’ he asked. The dancing lights showed the brilliant greens of the ferns, the tans and greys of clusters of mushrooms, discarded branches and leaves, a rabbit, squirrel and the damp moss floor. I mentioned all that I saw, overwhelmed by the balance, the perfection of it all. “I listened and listened and then I began to hear them; all the voices, some were grumbling, some were unkind, some frantic and none were happy. “All of the flowers seemed to be…well vain. This is what I heard ‘I have the true red’ said one red rose; and ‘Only I have grand stance’ said the iris. Among each and every flower boasting of its splendor; there was unhappiness, for it seemed that flowers have the very softest of voices. You doubt me, hold your ear as close as you might to any flower any flower you chose and tell me what you hear. “So brag as they might, they couldn’t be heard by even their nearest of neighbors. “Now they did have guests that stopped by I saw; the oh so busy bees, butterflies and the occasional aphid. “The bees arrived in a flurry of rapid movements and even more rapid talk. ‘The buzzzz queen said buzzzz buzz and buzz, gather-buzzz-ing buzz buzz, and buzz. Good-buzzz.’ The poor soft spoken flowers couldn’t get a word in edgewise. “When the aphids arrived and they often did; they never listened, rarely spoke, except to say, ‘Very tasty.’ A complement the poor flowers really didn’t relish. The Major pulled himself up as tall and straight as he could and in the most commanding voice he could muster. “You think flowers have problems.” The tree’s voice boomed over the top of all the meadow, through every path in the wood and out to the sea; “I stand as tall as a mountain and as strong and all I do is support a nest of birds, be a playground for a family of squirrels. A waste, just a waste.” And the tree’s voice trailed off, his eyes closed and he seemed to drift off to sleep. But the same lament was echoed by every other tree in the wood. Then the trees once more stood tall, ridged and silent. Out of the corner of my eye, I saw something moving in the wood. It rustled a few leaves, had no voice of its own…and then I saw it clearly…a little dust devil. As it twisted and darted its path through the deep wood; it was drawing ever closer to the sun lit meadow and it was carrying something, something very small. The Major walked to center stage and looking at his audience, more people than he would have imagined, his gaze fell on the eleven extraordinary people in the front row unconsciously bowing to them before he began. In a voice with more bravado than uncertainty “Good afternoon all, I am Stephen P. Quickstep, simple teller of tales, at your service.” Well, I’m off to a start if not a good one, he thought. Lowering his head he brought his right hand up to his chin, as if to stroke a beard or lost in thought. Then in a wink, lifting his eyes to the gathering, “Do you believe Faeries, Pixies and Elves, you know the Dawn Folk?” Before anyone could answer, with a wave of his hand as if brushing them aside, “No matter, most of the Dawn Folk that I have encountered don’t believe in people, they know we’re just tales they tell their children at night.” Some of the audience chuckled. “How could you know about the P? No one knows about the P? I said in disbelief. “The sun and the sea you say…like in an adventure. I was skeptical. “‘Yup, you could say an adventure; but do you have the courage to go on that adventure?’ Charly waited a moment, ‘I got me a simple test of courage, right here.’ He reached into the outside right pocket of his forest green coat and pulled out a twig, a little twig with four small leaves clinging tightly to it.” The Major squatted low and placed his hand in his pocket and slowly removed it holding a twig that was only seen in the mind’s eye. “That’s your test, your test of courage? “How does that work, this test, the twig will shiver and point at me if I’m worthy?